Beginning February 1, 2018, with the purchase of eligible tires, BMW Tire Center is offering a 12-month Road Hazard Program that provides coverage for damaged tires occurring from unexpected road hazards. These hazards include, but are not limited to potholes, sharp objects or other road debris. Coverage eligibility is determined by date or until 2/32″ or less of tread remains, whichever comes first. 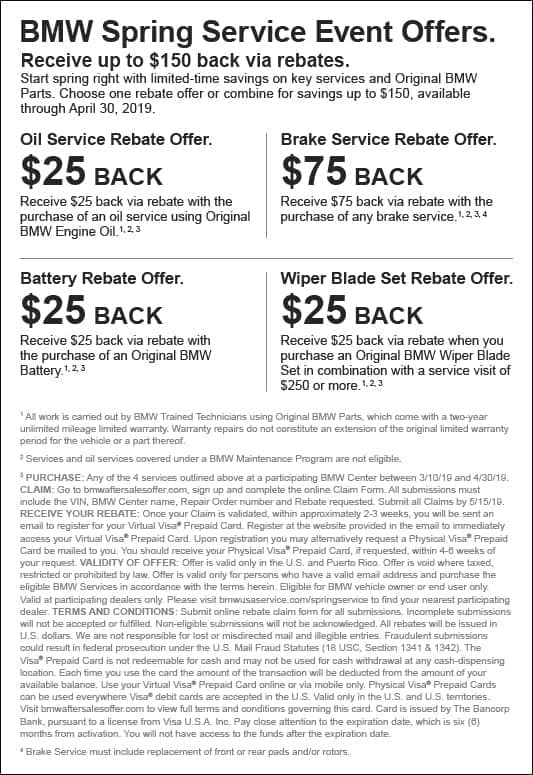 Eligible tires are BMW original equipment (OEM), original equipment alternative (OEA), and winter (WIN). Customers may return for a tire replacement and are covered at 100% of the tire cost up to $600.00. Speak with your service advisor for complete details.